More and more people are relying on Twitter as their source of new and interesting links. It makes sense, it’s using a social graph to curate your news. And depending on who you follow, it can be a very useful filter. A new site, The Twitter Times, takes that idea and puts it in an easy-to-digest newspaper-style form. Basically, The Twitter Times looks at all the people you follow on Twitter, finds their tweets with links in them, and creates a custom newspaper for you based on those links. But it’s not just a straight stream of stories based on how recent they are, instead the service looks at how many people have linked to the article, both in your social circle and outside of it. 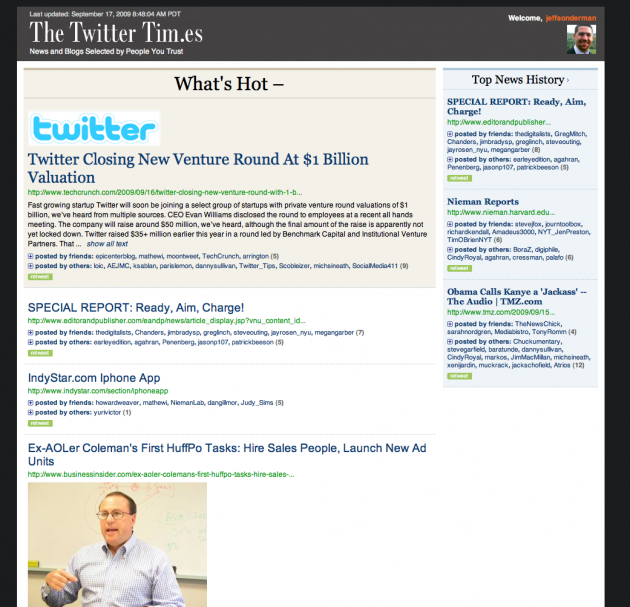 The Twitter Times is broken up into two columns, a “What’s Hot” section and a “Top News History” section. As you might imagine, the main “What’s Hot” column features more time sensitive stuff, while Top News History is the bigger stories that people keep linking to. If you see an article you want to read on The Twitter Times, you can simply click the “show all text” button and the article will expand in line on the page. You can also obviously click on the headline to read the full story on its original site. There is also a retweet button for every article, as well as a collapsed list of who tweeted it. The Twitter Times says it updates these links on an hourly basis, but the main idea is to be a digest for these links so you don’t have to constantly be monitoring your stream for new and interesting links. It’s a similar concept to the popular Tweetmeme, but obviously the curation by your social graph is key here. In that regard, it’s much more like the recently launched TweetMixx, but the newspaper-style visual layout could potentially be more interesting to some. Looking over The Twitter Times, it does seem like a pretty compelling way to digest news. But there is some room for improvement. For example, it would be nice if the service filtered out links that you have already tweeted out (and presumably already have read) yourself, as Kevin Marks noted. To get your own Twitter Times, simply visit the site and enter your Twitter name. It will take a while to populate your news, but they’ll tweet it out when it’s ready. Find out more about it in the video below. The Twitter Times – Video Tour from Maxim Grinev on Vimeo.